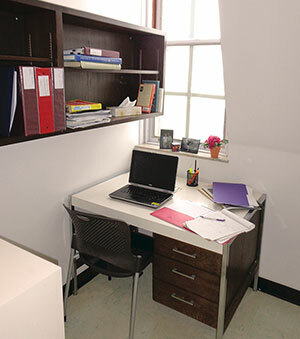 Graduate study carrels are very small offices that can be used by full-time graduate students who require quiet study space to prepare theses/dissertations. Since we recognize that the availability of carrels does not match the demand, after consulting with graduate students, we are pleased to offer two options — bookable graduate carrels and private graduate carrels. Two study carrels on the 5th floor of the Harriet Irving Library have been designated “bookable graduate carrels” that can be booked only by full-time graduate students, free of charge, in advance, for a period of one week (Monday at 10am until the following Monday at 9am). A refundable $30 key deposit is required to claim the carrel key. Book a grad carrel online! Twenty-seven study carrels on the 5th floor of the Harriet Irving Library have been designated “private graduate carrels” that can be rented by graduate students for either one term or one academic year; the cost to rent a private graduate carrel is $50/term, plus a refundable $30 key deposit. Preference will be given to PhD students who are working on their dissertations and who are in greatest need of this space. Download application form Submit your completed form to the Commons Service Desk at the HIL. Conditions of use for bookable and private graduate study carrels.